1. Soak bamboo skewers in water for at least 30 minutes ahead of time (if you don't they'll likely burn). 2. Grill bacon at 400˚ for about 5-7 minutes using the gill pan. Bacon should be cooked but not crispy. 3. Remove bacon and set aside. Do not clean bacon grease from grill pan. 4. Cut pineapple rings into 8 pieces. 5. Cut onion into chunks, two layers thick. 6. Peel shrimp and wrap in bacon. 7. Skewer ingredients, alternating. See photos! 8. Place kebabs on greased grill pan and grill over medium heat until shrimp is cooked through, about 3-5 minutes on each side. 9. Brush with barbecue sauce and serve hot. 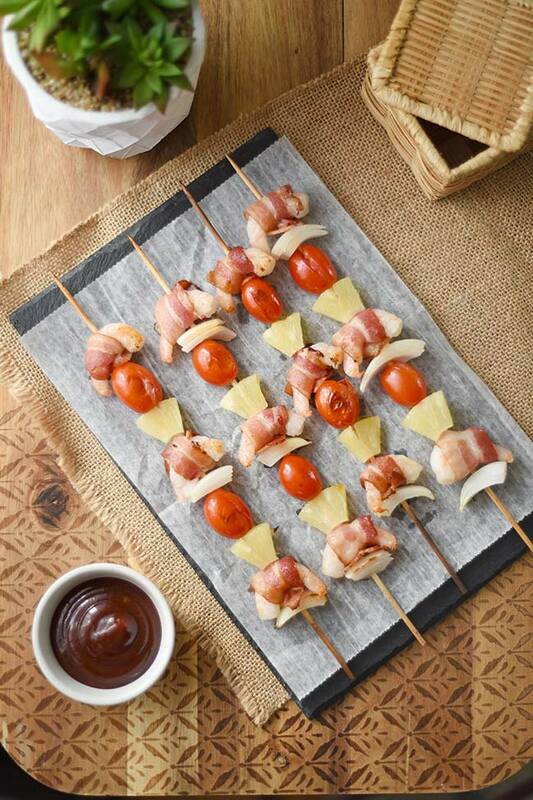 How fun are these grilled Hawaiian kebabs?! You can’t go wrong with a bacon, shrimp and pineapple combination. They’re fun to make, to look at, and—duh—to eat! I love how the ingredients layer together. They almost look like Hawaiian totem poles!! I’m also one of those people that sees things in clouds though so maybe that’s just me. But look closely. You see what I’m saying, right? Anyway, these are pretty easy to make if you follow the steps and they’re super yummy. 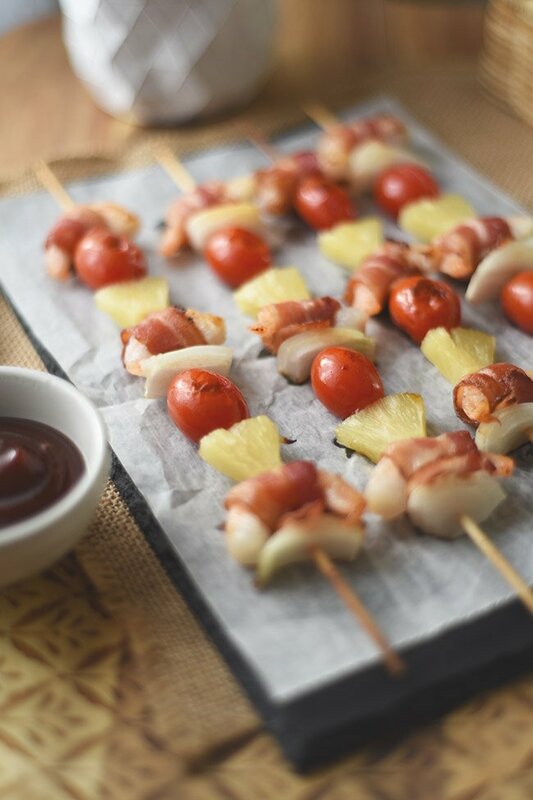 The bacon-shrimp-pineapple-tomato-vidalia-onion combo is awesome and it all comes together with a brush of barbecue sauce. I’m weird about my bites. Each bite needs to have all the flavors of the dish present. So when I eat these or any kebabs, I try to get a little of ALL the ingredients in one bite. It’s doable. I might look like a weirdo with a big mouth full of food doing it, but eh, I think it’s worth it. While I’m looking like a big-cheeked weirdo, what’s happening inside is the grilled grapes are exploding and blending with the pineapple so nicely while shrimp and sweet onion add nice texture and flavor and bacon comes through with the salty goodness you know and love. Worth looking like a goofball? Yeah. Def. Can you tell I’m really feeling these kebabs? We pretty much had a moment right there. But you’re going to see what I mean. Just you wait. This is actually a very old recipe post from 2010 that I finally went back and updated with new photos because I had to do these justice. Also, I earned a few things since then so I’m going to give you a little tip about bamboo skewers—they burn. What you need to do is soak the kebab skewers in water for at least 30 minutes before loading them up. These Hawaiian kebabs go really well with a Corona and a lime! You can serve these as an appetizer or as the main dish. 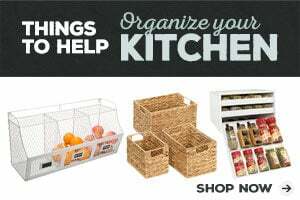 Great for parties or as a weeknight dinner. So versatile and so yummers! Can’t wait for you to try them. Let me know what you think. Are you feeling the Hawaiian vibes? Here are a few things that will help you make these successfully: a grill, kebab skewers, basting brush and a non-stick grill pan. 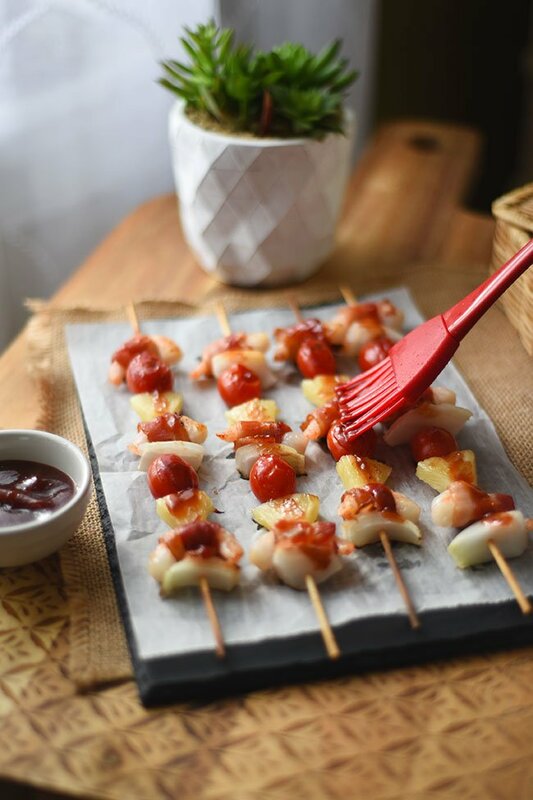 This recipe for Hawaiian Kebabs with bacon-wrapped shrimp and pineapple was featured on Menu Plan Monday and South Your Mouth!